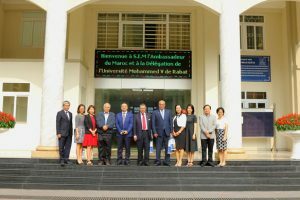 On March 29th, 2018, the University of Languages and International Studies – Vietnam National University, Hanoi (ULIS -VNU) held the signing ceremony of cooperation agreement with the University of Social Science and Humanities (USSH) – the University of Mohammed V-Rabat (Kingdom of Marocco). The ceremony was attended by Dr. Do Tuan Minh – ULIS’s President, Assoc. 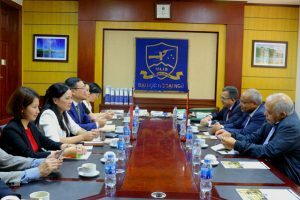 Prof. Ngo Minh Thuy – ULIS’s Vice President, Dr. Do Minh Hoang – Director of Cooperation and Development Office, Assoc. Prof. Ha Le Kim Anh – Director of Academic Affairs Office, Assoc. Prof. Dinh Hong Van and Dr. Nguyen Thanh Hoa – Dean and Vice Dean of the Faculty of French Language and Culture, Ms. Le Thi Khuyen – Deputy Head of the Division of Arabic Language and Culture. 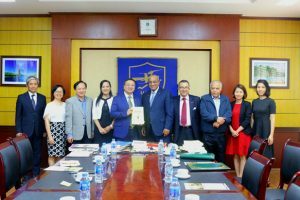 From Marocco, Dr. Jamal Eddine El Hani – the President of USSH (University of Mohammed V- Rabat) and especially Mr. Azzeddine Farhane – the Ambassador of Marocco to Vietnam. At the ceremony, representatives of the two sides signed a Memorandum of Understanding (MOU). 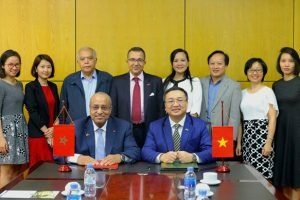 Accordingly, the two universities agreed to cooperate in many fields such as student and teacher exchange, workshop attendance, researches, summer courses organization and the possibility of collaboration in establishing the Faculty of Vietnamese Language in USSH – Mohammed V-Rabat University in Morocco. Addressing at the ceremony, President Minh affirmed that the potential for cooperation between the two universities was very great, especially in training French and Arabic languages. Highly speaking of ULIS’s reputation, both Mr. Jamal Eddine El Hani and Ambassador Azzeddine Farhane expected to carry out more cooperative activities between the two universities in the future, thereby contributing to the development of the friendship between the two countries in terms of education. Also at the signing ceremony, Mohammed V-Rabat University gifted ULIS a number of books written in French. ULIS welcomed professors and masters students of Thaksin University from Thailand.